Today’s recipe may be of the polarizing variety. Are these tacos trashy? Or are they genius? Half of you are probably grossed out by this idea, and the other half are totally picking up on what I’m putting down. For those of you who may be on the fence (or downright disgusted by this idea), are these too “basic American” for you? Too trashy? Just weird? If so, allow me to explain my thinking. Standard ground beef tacos are one of my favorite guilty pleasures. Straight-up. No frills. Store-bought taco seasoning packet and all. Did you grow up with your mom serving taco kits? I didn’t, but I discovered them in college. And I never looked back. Those little taco kits are so delicious. Crispy corn tortilla (which is basically like a gigantic tortilla chip, right? ), seasoned ground beef, and shredded orange cheddar cheese. Shredded lettuce and diced tomatoes were a bonus, especially for a poor college kid. I felt very grown up making those taco kits for myself. And if I’m being totally honest? I’m kind of craving one right now. Meeeeemmmmooorrriiiiieeeeees. 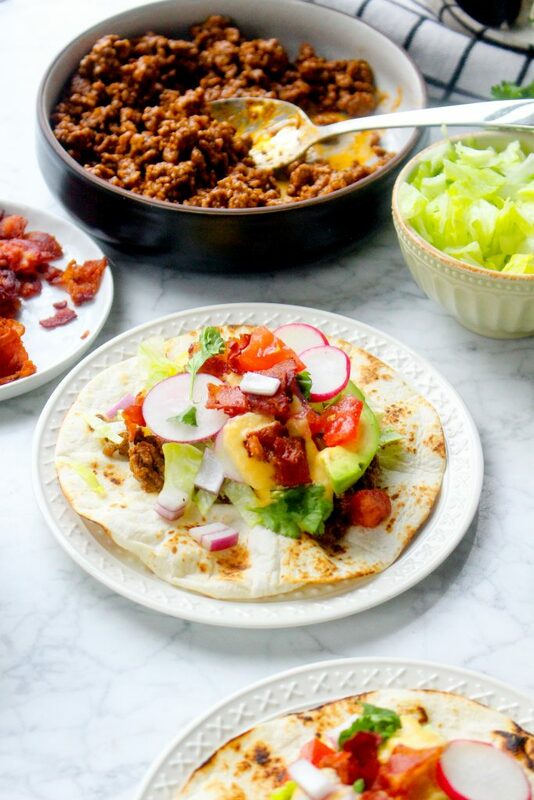 When it comes down to it, sometimes nothing beats a simple ground beef taco from my past. Except for a cheeseburger. I am one of those people (and anyone who is a meat eater is probably one of these people, too) who, when I crave a cheeseburger, there is NOTHING, absolutely NOTHING, in this world that will make it OK except for a perfect, juicy, cheesy burger. Once I get a craving like that, I must have said burger. It only happens once every few months, but boy, when it does….LOOK OUT. 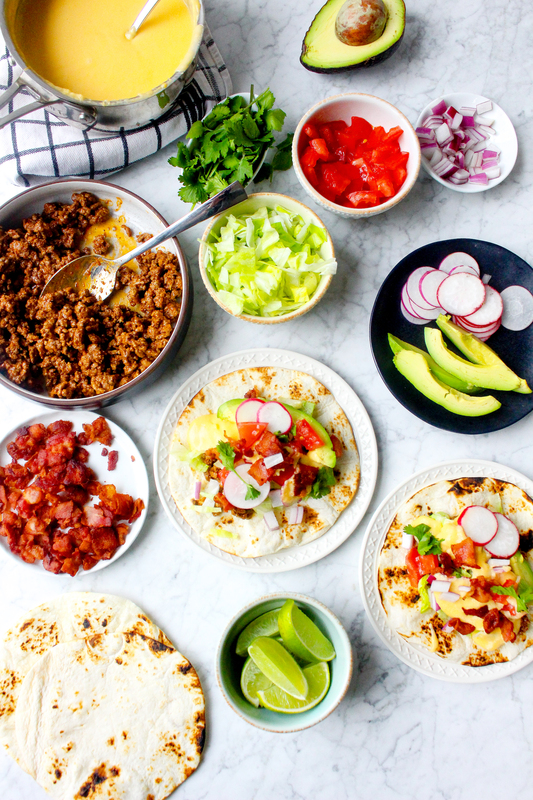 When I was brainstorming for this recipe, I knew I wanted to do a taco (um, Cinco de Mayo is only a few weeks away! We must be prepared). With beef. And some sort of fun queso. And then….a cheeseburger craving hit me. And this recipe was born. 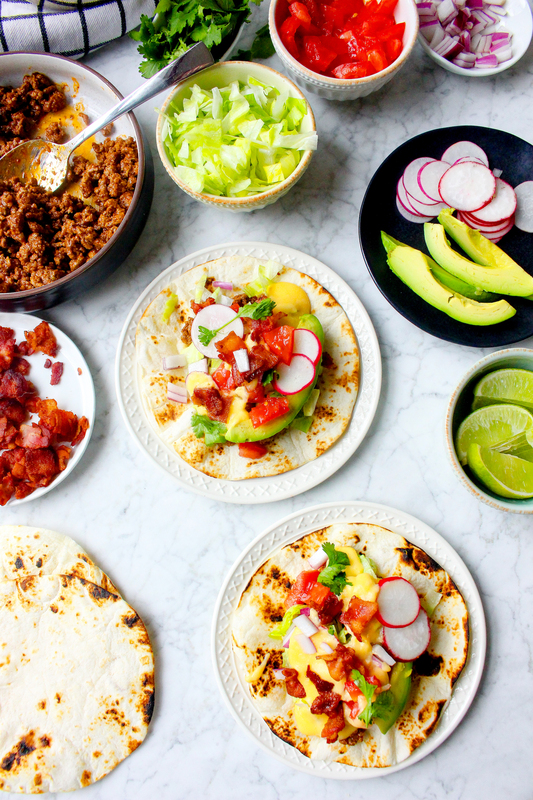 The resulting tacos are downright decadent and totally delicious. 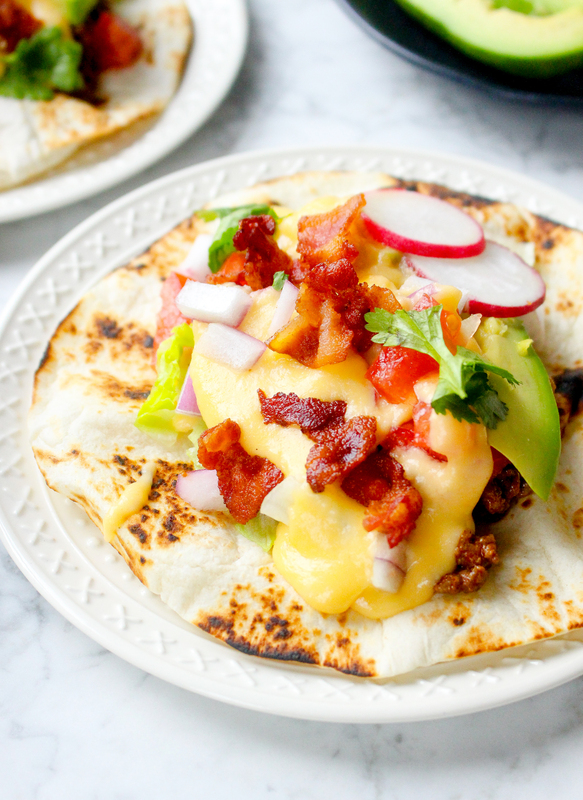 Think beef taco meets cheeseburger meets Tex Mex sloppy joe? They kind of have all the sweet-savory-texture-amazingness going on. I love mine loaded with LOTS of fresh toppings, like shredded lettuce, tomatoes, avocado slices, and fresh radishes. It makes me feel a smidge better about drowning everything in the cheese sauce. Plus, the texture is incredible. I love a lot of fresh with my heavy stuff. 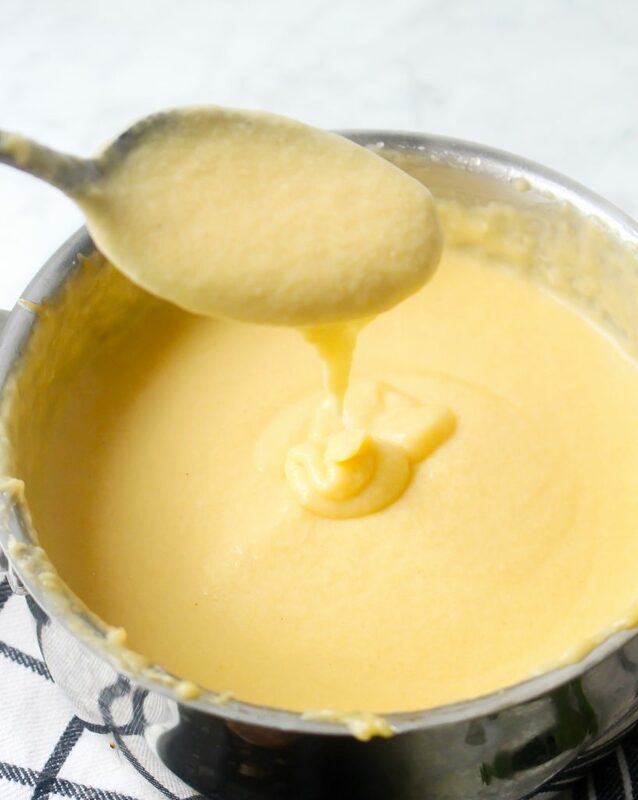 The cheese sauce comes together in minutes and is pretty much the stuff of dreams. Monterey Jack cheese is one of the my absolute faves. It just melts so beautifully! If you haven’t added it to your cheese sauces yet, give it a go. It mixes really well with the sharpness of cheddar, too, which is also a necessity. I don’t think my fridge has ever been without at least one block of extra sharp cheddar cheese. Seriously. It’s a weekly staple around here. Even Kieran, who is the world’s pickiest eater, prefers his cheese sharp. Wonder where he got that from? My favorite way to serve tacos of all kids is buffet style. I think it’s very important for a successful taco to be personalized. For instance, Dan is slowly but surely coming around to avocado, so he may add less than me. Me? I can never get enough citrus, so I juice like half a lime on each taco (I wish I were joking). We both go for the cheese sauce because, well, duh. It’s cheese sauce. And we both love the crunch of the fresh veggies. It’s FUN to put everything out like I have in these pictures and just let your friends and family have at it. Not only does everyone get exactly what they want, but it also makes for some super low-key hostessing. If you’re still on the fence about these tacos, I get it. We can still be friends. Just don’t judge me for flippin’ LOVING these. They are food fusion at it’s finest! Lazy cheese river of dreams. Heat a large skillet over medium heat and add the bacon. Cook until crispy and rendered. Remove and set aside. 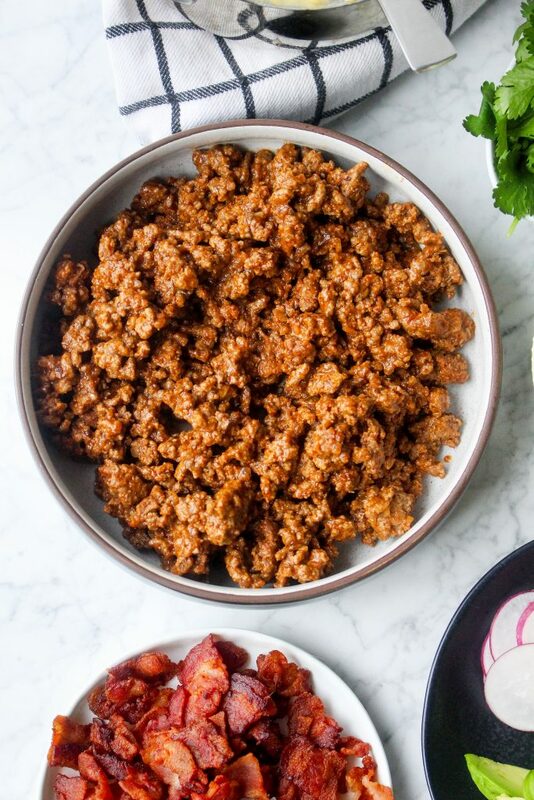 To the same pan, add the ground beef. Cook for a few minutes, breaking it up with a spoon or spatula, and then add in the taco spice, ketchup, mustard, Worcestershire, and pickle relish. Mix everything in well. Cook for 5 minutes, stirring frequently, or until the beef is cooked through and mixture is homogenous and sort of saucy. Season, to taste, with salt and pepper. While the beef is cooking, heat a saucepan over medium heat and add the butter. Once it melts, add the flour and whisk well. Cook for 2 minutes. Whisking constantly, slowly stream in the milk. Cook, stirring frequently, for a few minutes or until the mixture thickens enough to coat a spoon. Whisk in the cheeses and stir until melted. Season, to taste, with salt and pepper. Keep warm until you are ready to serve. 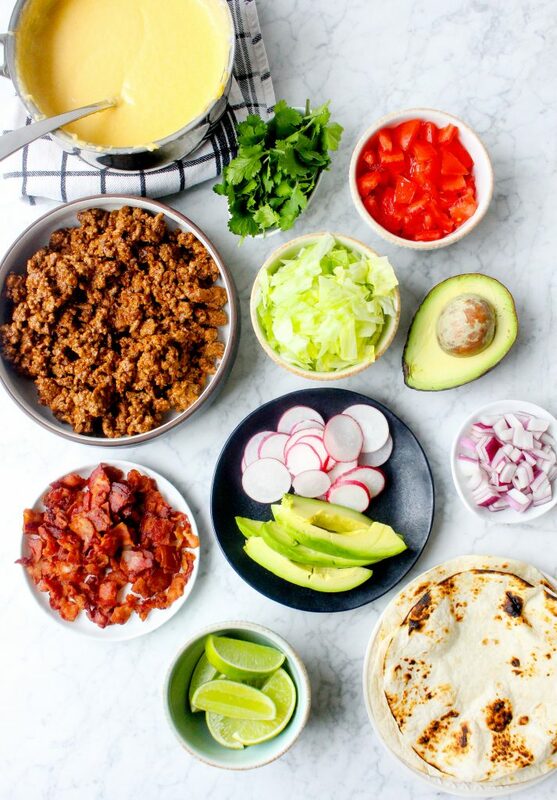 Prep all your toppings and set them in bowls so that everyone can create their own tacos. Serve while the beef and cheese sauce are still warm. 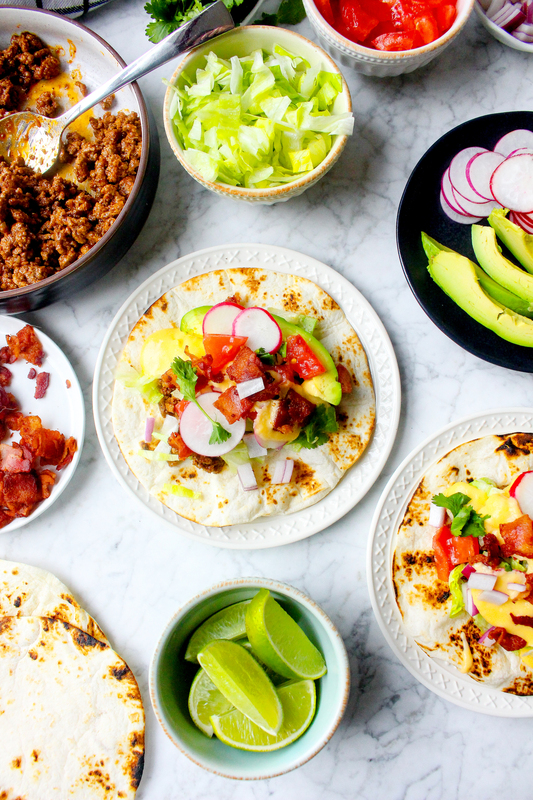 My favorite taco consists of flour tortilla (toasted over my stove gas burner) filled with the beef, cheese sauce, crumbled bacon, sliced avocado, tomatoes, lots of fresh lettuce, a couple sliced radishes, a sprinkle or herbs, and a healthy spritz of lime juice. Holy. Moly. 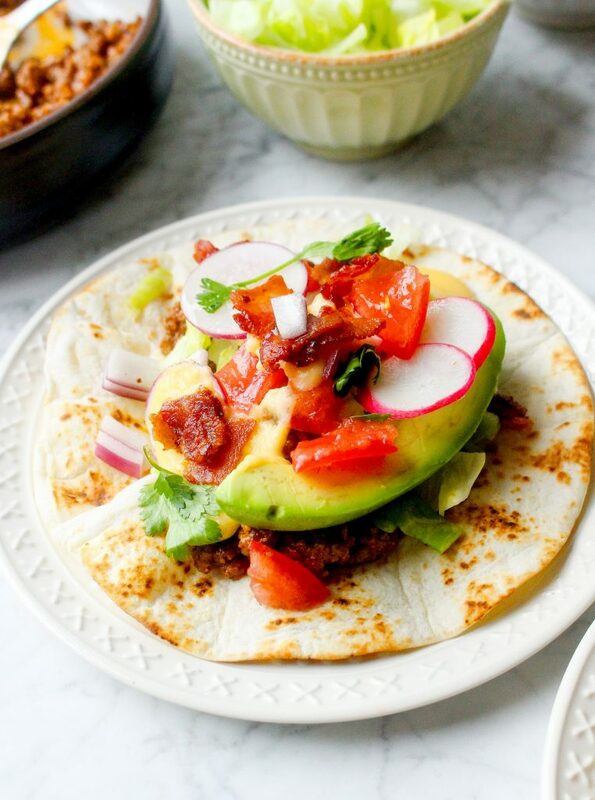 This is taking taco Tuesday to a WHOOOOLE new level! Cannot wait to try!